Today’s guest post is by Sasha from The Mushy Mommy. She discusses dealing with her emotions as she begins the weaning process in hopes of being able to continue to grow her family by trying for another baby. I know many women can relate to these feelings and I’m thankful that Sasha shares her struggle with us. 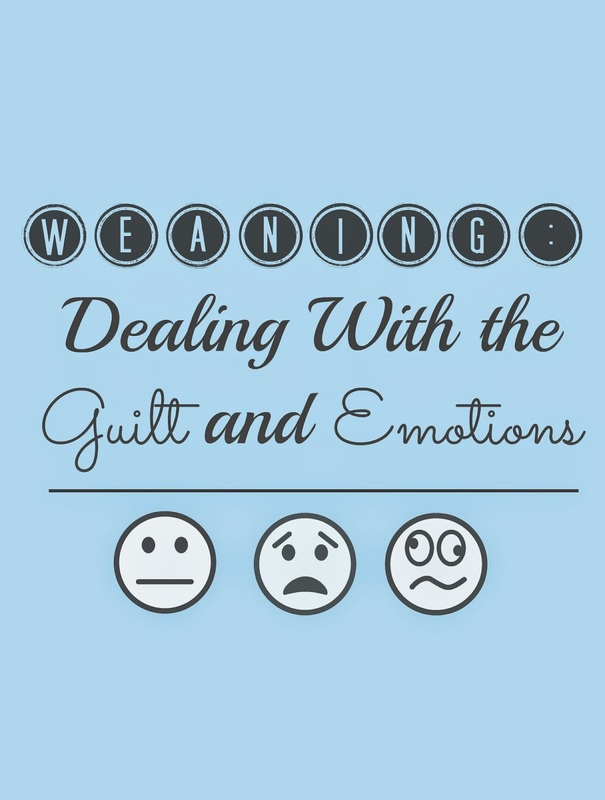 How many of you can relate to the guilt of weaning? I sit here today, typing this as I am overcome with defeat and emotions on our weaning journey. But first, let me take a second to tell you a little about me. My name is Sasha and I blog over at this place called, The Mushy Mommy, where I talk about all sorts of fun things from parenting to living green. I have a fourteen month old, spunky and feisty little girl. And yes, we are still proudly breastfeeding. No one really knows how long they will breastfeed or how the breastfeeding relationship will go between a baby and a mother (although most of us pray it goes great). I knew that I wanted my daughter on my milk for a year, but falling into the common views of society, I assumed I’d no longer nurse past six months. From the first time my daughter latched on and we began our breastfeeding journey, I knew that those six months were no longer my deadline. Now as I sit here with a toddler, I am currently in the process of trying to slowly wean her in hopes of getting pregnant again soon. I can’t even begin to express the emotional side of this. For starters, I’m trying to wean my daughter off of something that she depends on more than most can realize. Sure she doesn’t need me to nourish her anymore necessarily, but my milk still does her body wonders and I still provide her with what she often needs most: comfort and security. There is a lot of guilt that goes into weaning a child who otherwise shows no real signs of wanting to wean. While it was super easy to get her to a point of nursing just for naps and sleep, I am now at a loss as to how I should proceed with weaning. How do I take away something that she cherishes so much and that even I, in the middle of the night at 2 am, love as well? How can I deprive her of that? For every breastfeeding relationship there is indeed an end. For some of us that ending is based on the child’s wishes; for some it is because of unfortunate events; and for some it’s just because mother realizes it is time. I stand in the middle where because of our situation I feel like it is time, but I would rather so desperately that it’d be because of my daughter’s independence and ability to self wean. In fact, as of a week or two ago I saw signs of her beginning to wean herself. Now, in the middle of what appears to be every tooth popping out at once, I stand defeated and emotional over what seems to be our weaning journey on a stall. However, I have to keep reminding myself that I shouldn’t feel guilty. And neither should you. No matter how long you breastfed for, you gave your child the most amazing start at life. You gave them one of the best (and healthiest) gifts that they could ever receive. And while yes, weaning is literally the hardest thing I’ve ever done, I know that our timing is right. I also know however that there is no immediate rush and that I can take this slow. I know that I can use these last few weeks or months of our journey to enjoy it and to overcome the emotions (and the occasional guilt) that I do feel. I know I can lead her in this together so that way it’s almost like a mutual decision. We all need to be reminded just how amazing we are as mothers. When my toddler looks up at me with a smile and then nurses away, I am reminded at just how special and amazing this is. I am reminded no matter when I stop, I know that I did do a good job.